On my recent visit to England I went to Lichfield Cathedral in search of a very special angel ... a limestone carving of Gabriel. 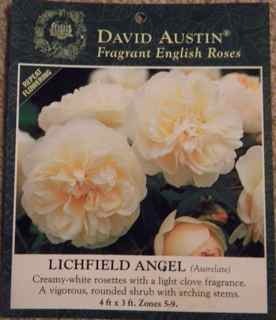 If you wonder what connection this has with gardening, you may remember I made David Austine's rose 'Lichfield Angel' the focal point of my new rose garden. I chose this particular rose for it's name which brings back happy memories. 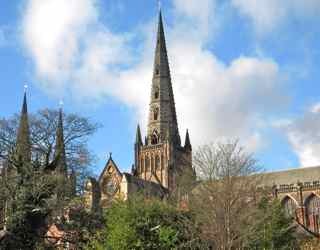 I attended high school in this beautiful city ... Lichfield Friary High School for Girls (that's right, there were no boys). And my maternal grandmother was born in Lichfield. 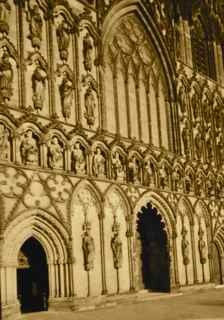 I have loved Lichfield Cathedral since during my high school years we frequently went there to worship. Back then the limestone angel was not to be seen. 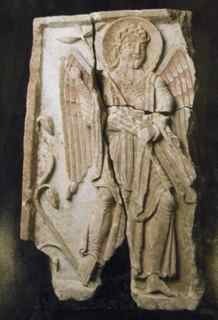 It was broken and buried for centuries - until, during excavation work in 2003, three pieces forming the 'Lichfield Angel' were found under the cathedral floor. The city of Lichfield is dominated by the medieval Cathedral's three spires. (There is only one other cathedral with three spires. It is in France.) The day I visited was cold but dry. I did not enter immediately, but stood admiring the extravagant statues and carvings on the outside walls. There are over one hundred life-size statues on the west front alone. The elaborately decorated west front. I was able to pick out the Saxon king, Wulfrun, who ruled Mercia before England was called England. I know him because I belonged to Wulfrun House in school. King Wulfrun sits on his throne in a line of other Saxon kings above the west door. 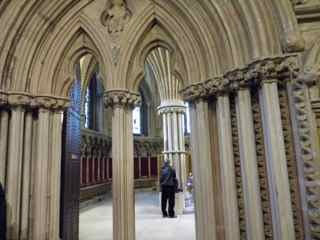 Outside and inside, the medieval masons built innumerable Gothic arches. 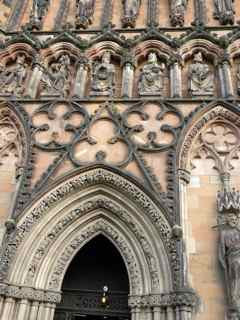 Once inside, I was directed to the Chapter House, the entrance to which was through another beautiful archway. 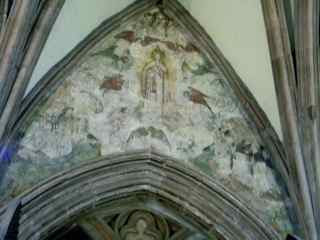 Inside the Chapter House, visitors gaze in awe at a medieval painting of the Assumption of the Virgin Mary. I was not disappointed with the plaque's beauty. I was in awe of its antiquity. 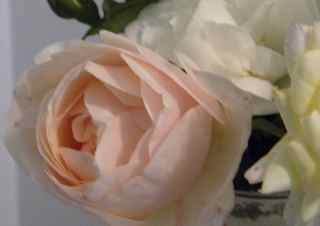 I can understand why David Austin chose to name a creamy-white rose for this limestone carving. I am glad he did and I am so glad I saw it. I now feel I have a little bit of England and of my heritage in my Pennsylvania garden. 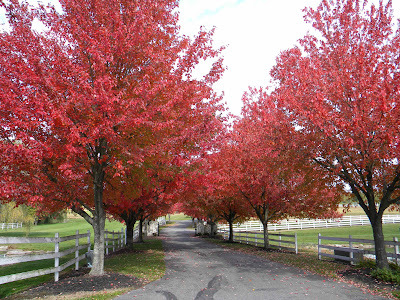 Autumn in Pennsylvania is stunning! 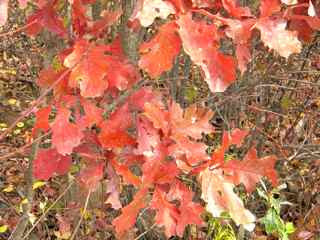 Even this year, following a long, summer drought, the leaves are not disappointing. H.H. 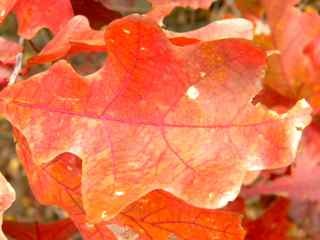 suggested we go for a car ride - 'leaf peeking' as the locals and tourists call it. I readily agreed, grabbing the camera, of course. 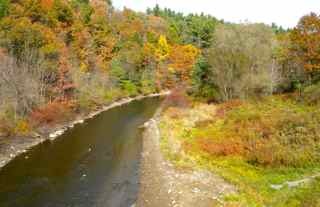 Laura invited me to play the blogging game of listing '10 things I like to do' and as a fall drive is something I love, I decided it would be first on my list. 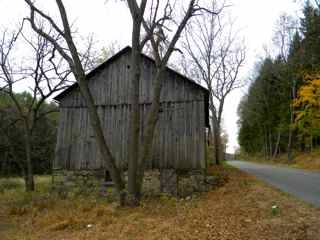 As we toured the immediate countryside, I snapped a few pictures (all the pictures in this post were taken that day) while considering nine more 'likes' I would include. I realized I really enjoyed photography, which surprised me. I started taking pictures just to record the events in my garden. With the advent of my blog, I tried to improve picture quality as I acquired an audience. Although I don't have a top-of-the-line camera (only a point and shoot), I am often rather pleased with the results. 1. 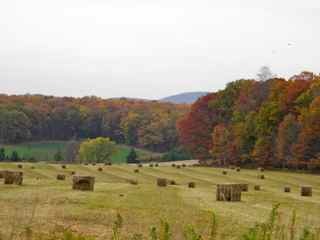 Fall leaf-peeking in Pennsylvania. 3. Giving gardening programs, for example at garden clubs and my local university. I use Power Point or Apple Keynote for my slide shows and I like preparing the programs just as much as presenting them. This is linked to my enjoyment of photography, as the pictures I use are all my own. 4. Visiting my homeland, England. Much as I love my adopted country, there is no place like home. 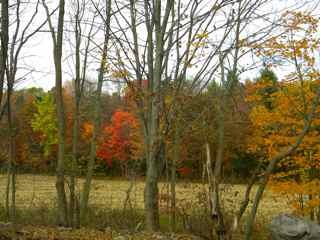 As I write this, I am 'across the pond' visiting my mother. 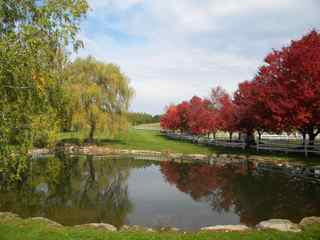 Yes, I still think of this as home and get homesick when I am away too long. But paradoxically, when I am here for a while, I start feeling homesick for America! 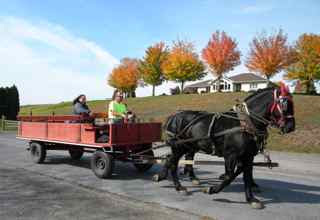 Our neighbor, Roger, was taking a fall drive, also. 5. When I am in England I love to go to garden centers with my dear friend, Carole. English garden centers are so different from those in America because they have coffee shops! Or maybe they are tea rooms, but they serve coffee. When I am here, I so miss the coffee I have become accustomed to in the United States. My mother serves instant coffee, ugh! So at the garden center I can get my coffee 'fix' and catch up with my friend's news, while surrounded by flowers. Lovely! 6. I like spending time with my miniature horse, Dude. 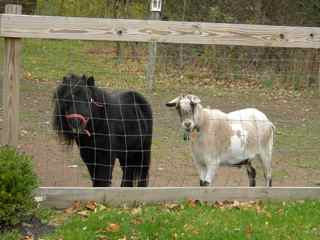 He likes spending time with his best buddy, Billy Goat. Animals give such unconditional love to us. 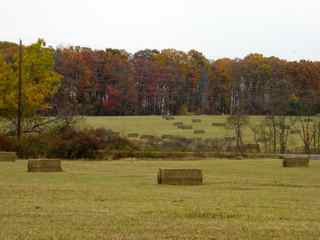 A glimpse of the upper field on our farm after the corn was cut. 7. Every year, usually in June or July, I enjoy giving tea parties in my garden. I usually give two or three each year. One is our annual church garden party and another is a get-together with the master gardeners with whom I graduated. I look forward to these events enormously. I also do small tea parties for close friends. It's my way of showing off my garden and at the same time practicing a beloved English tradition. I make scones, tea sandwiches, and trifles. Not very nutritious, but delicious! 8. I love watching old films on the television's classic movie channel. I can watch some of them over and over again. My favorite is Casablanca; and I like anything with Katharine Hepburn. A great way to relax after an exhausting day gardening! 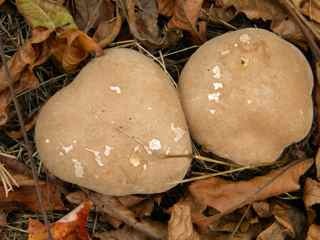 We found these heart-shaped mushrooms near the old barn. 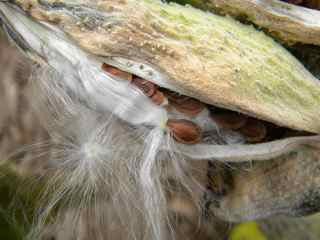 Milkweed. I'm hoping for lots of monarchs next year. 9. Grandchildren coming for a weekend with Nana and Pappy is such a joy! At our house they have their own bedroom, furnished especially for them. The rest of the house tends to be English-country style, but the boys' room is strictly Americana. It was a fun room to decorate and it is double fun when occupied by lively young boys. 10. I really enjoy seeing my children and grandchildren sitting around my dining table at Christmas! It does not happen every year as they are scattered around the country. My son and his family live in Phoenix now, and I don't think they will want to come east to our chilly climate - their weather is so pleasant at that time of year. But I have lovely memories of family Christmases and look forward to many more. Well, as I read through my ten 'likes' they seem to be centered around gardens, food, and family ... with an emphasis on food! Oh dear, now you know a little more about me, you can draw your own conclusions. I hope you enjoyed reading this post as much as I enjoyed writing it. I am honored that Laura chose me. Thank you, Laura. In return, I should ask ten bloggers to list their ten favorite things to do. I hope you will forgive me, but I am just going to give an open invitation, dear gardening friends. Let me know if you decide to take the challenge.